Whatever your skin type – Quick Fix Facials has the solution. Wonder face masks packed with hero ingredients to effortlessly and efficiently banish everyday skin issues including dryness, redness, blemishes, blackheads, dullness and toxins. With targeted ingredients known for their proven efficacy and skin beautifying benefits. 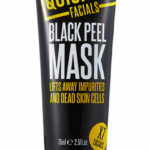 We’ve created our Black Peel Face Mask with a formula which combines Active Charcoal, Witch Hazel and Allantoin to smooth the skin’s texture and draw-out dead skin cells. This will help to purify skin and impurities such as pesky black heads, blocked pores and excess oils. Helps clear stubborn & reoccurring blackheads, clogged pores and skin in need of a deep and thorough clean with Pink Rose Clay decongest, Glycolic Acid to help balance out uneven skin tone & Pomegranate extract which is packed with antioxidant and anti-ageing properties to encourage radiant skin. Helps with excess oil, congested, blemish prone skin or a general combination skin type. Includes Green Clay and Kaolin to help cleanse the skin by drawing out impurities, Willow Bark to help clear pores & super fruit Blueberry which helps revitalize the skin. Is your thirsty, parched and dry skin in need of some TLC? This mask includes Hyaluronic Acid to help replace moisture and provide deep hydration to skin, Vitamin E which is full of antioxidants that will help keep skin in good condition and Marine Collagen, a source of collagen which will help skin retain moisture and elasticity. A product for dull and tired skin that needs an energy and moisture boost. 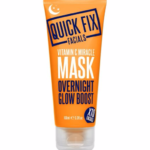 This mask contains Vitamin C and Licorice which are both known to help enhance skin radiance and glow. It is also packed with Hyaluronic Acid + Shea to help deliver intense hydration, as well as Papaya Extract which is rich in the omega 6 and 9 essential fatty acids, Vitamin A, C and K.
Environmental toxins, dirt and debris played havoc with your skin? Active Charcoal is rich in minerals and it helps clear deep dwelling pores and free skin of toxins and impurities. 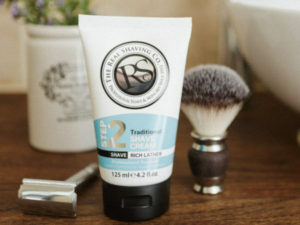 This formula contains Dragon Fruit which is bursting with Vitamin C to promote radiance and Cinnamon extract which is a reputed antiseptic, plus astringent properties to help clarify skin. Is your skin sensitive, prone to redness, irritated and misbehaving? 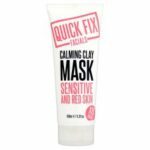 Quick Fix Calming Clay mask contains Oatmeal to help relieve skin dryness and discomfort and Aloe Vera which is perfect for helping to reduce skin inflammation and provides moisture. Chamomile Extract helps soothe and calm sensitive skin whilst Rose Extract helps minimise redness caused by enlarged capillaries. 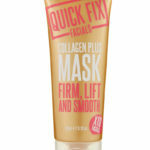 Our Collagen Plus Face Mask has been created to help solve skin that feels tight, dry, lacks a healthy glow and when fine lines and wrinkles are starting to show. Collagen is an ingredient which helps improve skin’s suppleness and elasticity. The formulation also contains Hyaluronic Acid + Vitamin E to help plump skin with moisture and promote cellular renewal, as well as Passion Flower oil and Charcoal + Volcanic Lava Sand to help draw out skin impurities. 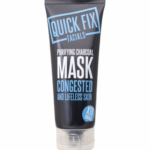 Want to learn more about Quick Fix Facials?